The Ultimate Cover Sheet: With it, not a word can be released; without it, almost everything is declassified. Washington, D.C., May 6, 2005 - Legal motions and sworn declarations filed in federal court this week have refuted Bush administration claims that the CIA can never release President's Daily Briefs given to President Lyndon Johnson in the 1960s because that would damage national security and violate presidential privilege, according to the Web posting of the documents by the National Security Archive at George Washington University. University of California, Davis professor Larry Berman, a scholar of the Vietnam War, filed suit against the CIA when it refused to release two Briefs from the day before and the day after Briefs that had been declassified and made public more than a decade ago. He is represented by Thomas R. Burke and Duffy Carolan of the law firm Davis Wright Tremaine LLP, and by Meredith Fuchs, general counsel of the National Security Archive. 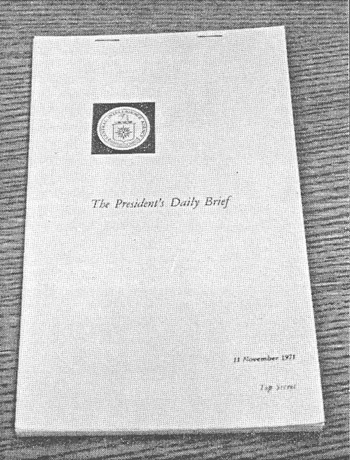 In support of Professor Berman's case, former Johnson aide Bill Moyers, who reviewed many of the Briefs when President Johnson read them, said in a declaration that the Briefs were not "deliberative" or policy advice, but rather factual reports on world events, and that release of the Briefs could be accomplished without damage to national security by redacting any still-sensitive sources-and-methods information. CIA information review officer Terry Buroker had filed a sworn declaration with the court claiming that every single word of the two Briefs had to be kept secret because release would contribute to a "mosaic" of knowledge about sources and methods and violate Presidential Privilege. He did not explain why 30 Briefs or excerpts of Briefs already have been publicly released without any harm. The filings this week included copies of more than 30 Briefs and excerpts from Briefs that had previously been declassified and released. Two of the released Briefs provided to President Johnson were declassified the same month Professor Berman filed his lawsuit in December 2004, under Mr. Buroker's purview, apparently because neither was on PDB stationery. Larry Berman, Plaintiff v. Central Intelligence Agency, Defendant. Attachment 14 - August 9, 1965 memorandum to President Johnson from Special Counsel Harry C. McPherson, Jr.
Attachment 24 - Excerpts from William Conrad Gibbons' "The U.S. Government and the Vietnam War: Executive and Legislative Roles and the Relationships"
Attachment 25 - Excerpts from Ellsworth Bunker's "The Bunker Papers: Reports to the President from Vietnam, 1967-1973"
Attachment 26 - Excerpts from Professor Jeffrey Kimball's "The Vietnam War Files"
Attachment 1 - Excerpts from March 2000 National Archives and Records Administration report, titled, "Records Management in the Central Intelligence Agency"
Attachment 3 - Excerpts from a 1996 study published by the CIA's Center for the Study of Intelligence, written by John L. Helgerson, entitled "Getting to Know the President: CIA Briefings of Presidential Candidates, 1952-1992"
Attachment 14 - Excerpts from U.S. State Department's series on Foreign Relations of the United States 1964-1968, Volume XIX, Arab-Israeli Crisis and War, 1967. Attachment 17 - September 7, 1968 "Special Daily Report on North Vietnam for the President's Eyes Only"